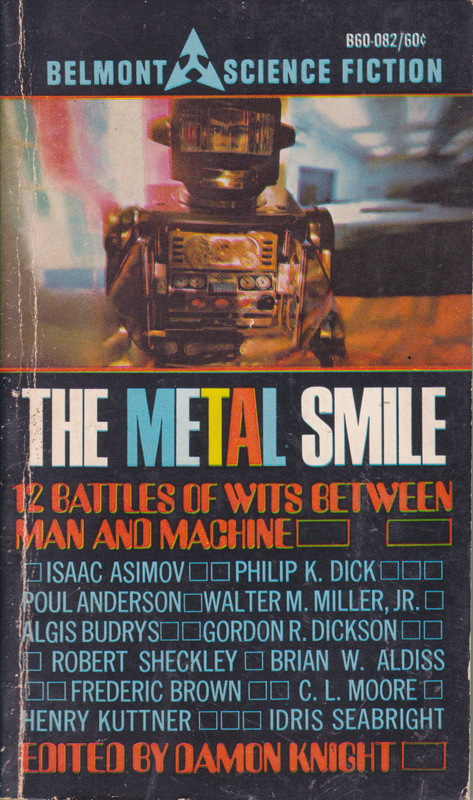 It turns out that, like the last time I did a short story from this collection about robots, we’ve got another one where the key to the story is that there are some things humans can do that robots can’t. Unfortunately, that means there isn’t a lot more that I can say on the matter. On the plus side, this was a fun story. This one’s by one of the greats: Poul Anderson. A relative of mine? Unlikely. There are a lot of Andersons in the world. It’d be kind of nice, though. I have to admit that my only other exposure to Poul Anderson’s work is The High Crusade, a book I loved when I first read it, but that was probably a decade ago, if not more. I think it’s about time for a re-read. It did punch a lot of the right buttons for me, considering that I did a lot of medieval studies in college (for the job prospects, obvs). “Quixote and the Windmill” is one of those short stories that is, by and large, a few people talking until one of them learns a lesson. I don’t know about the overall attitude of the reading public to that kind of story, but I like them. I think I just like the sheer fantasy of them. I’d love to live in a world where people talk to each other in a civilized way and some of them come to realize that they’re wrong and admit to it and take on new ideas based on new evidence. Let’s all sit back and dream for a minute. The story opens with a robot. I think this is the first book in this collection to feature an honest-to-god clank-clank-zort-clank robot. It doesn’t have a name. It’s just the robot. It’s the first robot. And all it’s doing is walking across the landscape. We cut to a pair of guys getting drunk in a bar. They’re named Borklin and Brady. They’ve got problems. They can’t find jobs. We learn, over the course of their drunken conversation, a little about the world they live in. Machinery has taken over most of the work. Borklin is a big guy, good at manual labor. Machines do all that. Brady is his foil. He’s wiry but smart. His problem is that he’s too smart for the jobs he qualifies for. He gets bored with routine stuff. He’s just not smart enough for the work he wants to do. He wanted to be a mathematician, but machines do that now. Sure, there are humans who need to program the machines and check up on their work, but that requires real smarts, which Brady doesn’t have. He’s right in a stinky middle. Neither of them will starve. This world has a Universal Basic Income that’ll see to that. Since machinery does all the work, there’s enough to go around for everybody. In a way, it’s paradise. No poverty, no starvation. Both Borklin and Brady aren’t satisfied with their lot, though. While they’re fine with not starving, they both have drive. They want to do something useful. Sure enough, there are avenues for that in this society. If you want luxuries, you work for them. It’s just that neither fellow can find a way to do that. They’re just outta luck. I was afraid that Anderson would turn this story into some kind of anti-socialist screed or something. I see here that the author had a bit of a libertarian streak, so there’s probably something to that fear. Still, that’s not how this story went down, so I was satisfied. Instead, the guys find the robot and start arguing with it. They say that the robot is a threat not only to themselves personally, but to humanity in general. It basically all boils down to the robot saying it’s even more useless than the humans. It’s self-aware, sure, and it’s designed with no specialization in mind. It was basically just made to see if it could be done. Any specialized machinery could do anything it could with more efficiency, and it can never take over humanity’s place in the world, because humans have things like imagination. It’s a useless robot, made for no reason. So once again we’ve got a human weakness (a tendency for drunkeness) reframed as a strength over our machine children (we can distract ourselves from our lot). Bear in mind, Anderson’s robot in this story has emotions. While I suppose one could have an endless argument about the truth of machine emotions, this story didn’t. It took it as a given. The robot said it had emotions. And it’s bored as hell. And it’ll probably live for another 500 years. While the story leaves a few questions open (Surely an intelligent robot with that much time on its hands could figure out something to do? ), I thought this was a pretty fine science fiction story as joke that makes you think a little bit. Does it have much in the way of a takeaway? Can we apply it to our current situation and maybe learn a little about ourselves? I don’t think so. Still, it does present us with the idea of a Universal Basic Income, something that’s been on my mind for a while. And in 1950, no less! There was a 99% Invisible episode about it last September that’s worth a listen. Every episode of 99% Invisible is worth a listen. I would follow Roman Mars into The Devil’s own Hell if I thought there was a chance he would talk about the design aspects of it. The only other place I’ve seen that idea brought up is actually in the much more recent Expanse novels. I’m sure there are plenty of works with something similar—probably even ones I’ve read for this very blog—but I can’t think of any off the top of my head right now. And there are probably other works that look more seriously at the mechanization of industry and what effect that has on workers, but Anderson did a good job. I would recommend Robert Anton Wilson’s Schrödinger’s Cat Trilogy as supplemental material, which has a pretty good bit about it in book two, where the changeover process is incentivized by people getting a stipend if they create a machine that can do their job for them. So yeah, this was a fine story. It wasn’t too deep, but it’s a good jumping off point for thinking about some serious things. Plus it had a pretty good punch line. RAH’s first novel, written in 1938 but not published until 2003, was For Us, the Living. It was based on Edward Bellamy’s Looking Backward and revolved around a society with assured basic income. I read it despite warnings because it was almost the only RAH I hadn’t read, and I actually enjoyed it. Oh nice! I haven’t read that one, probably because of similar warnings. Poul Anderson is one of those authors who’s stories I know I’ve read – but I’ll be danged if I can remember any of ’em. Anyroad, this one looks like a good place to start.